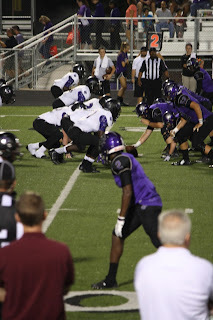 Just a few months after our move to Texas we spent a Friday night watching two local high school football teams battle it out on the gridiron. We attended the game not because of our interest in high school football, but because that particular game took place at Kyle Field and we desperately wanted to see inside the storied stadium for ourselves (without having to spend hundreds of dollars on Aggie tickets). 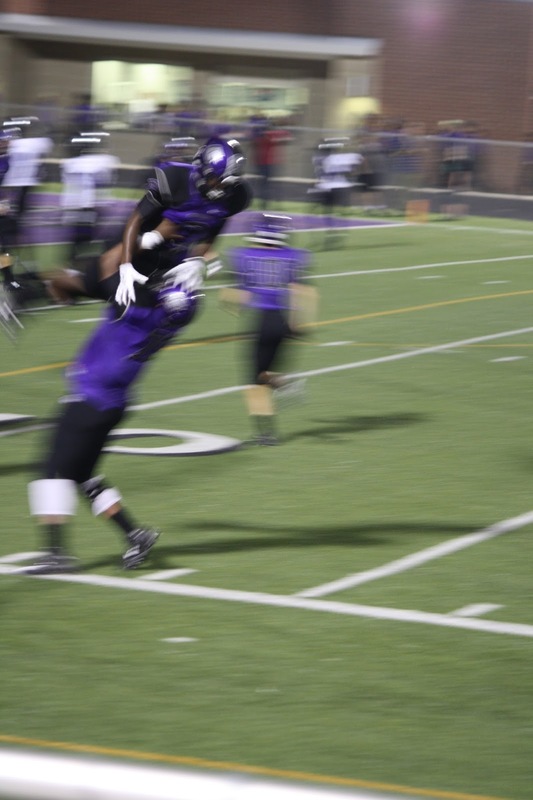 After that night, we didn't attend another high school football game for nearly four years. Where Tom and I grew up - two different states, even - high school football mattered only to kids in high school and the parents of kids who played high school football or participated in a program (band, cheer, dance) affiliated with high school football. We came to learn, gradually throughout the last four years and then suddenly all at once less than two weeks ago, that this is absolutely, positively not the case here in Texas. 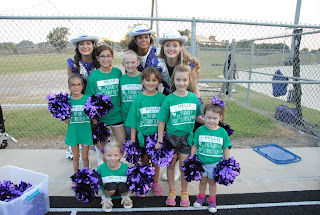 After years of listening to friends describe their Friday evenings in terms of touchdowns and halftime shows (and after watching a few episodes of the once-popular television program "Friday Night Lights"), I suppose we knew what high school football means to Texans. 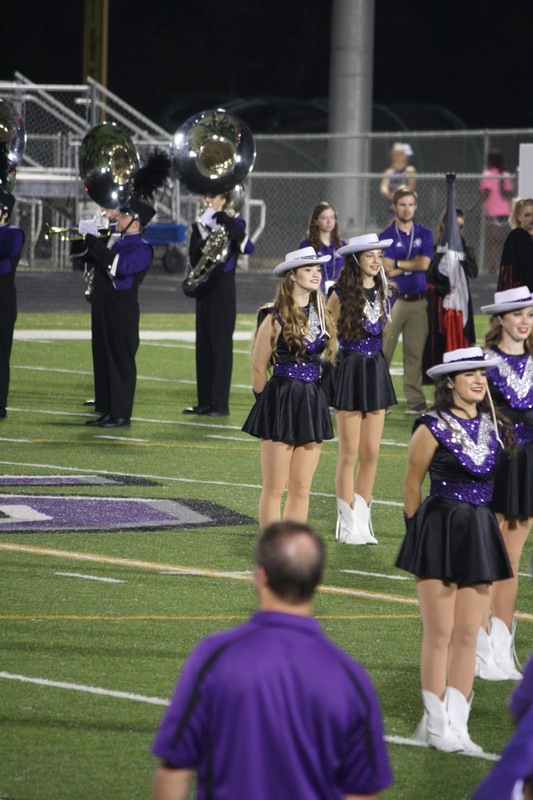 But we didn't really understand the passion, pride, and tradition until two weekends back, when for the first time we immersed ourselves in an authentic Friday Night Lights experience. We have Hallie to thank, really. 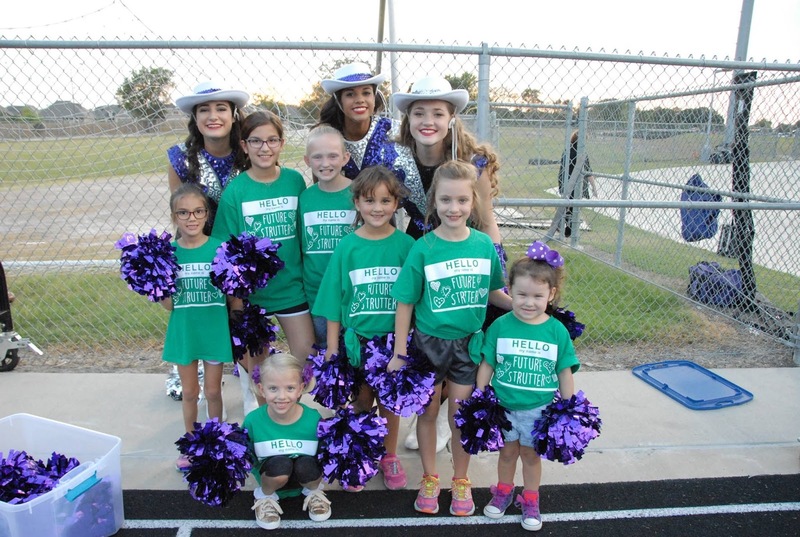 Back in August she attended a dance camp hosted by the College Station High School Strutters (the school's dance team), a perk of which was the opportunity to participate in the opening "ceremonies", alongside the Strutters, at one home football game. 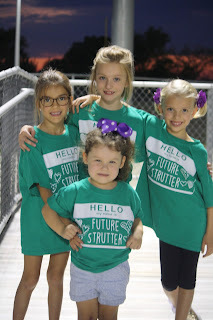 Because Hallie went to camp with a number of her friends, we were able to enjoy our Friday night football game with her friends and our adult friends as well. First, the stadium. It belonged not in the backyard of a high school but on a small university campus. The pristine field (also used for women's soccer and track and field) was surrounded by bleachers for days, multiple concession areas, and - get this - an adequate number of clean, modern, women's restrooms. I never saw the locker rooms, of course, but if they're anything like the adjacent Field House (where I had wandered around a few days earlier while on a mission to buy tickets for the game), they were built to impress. Second, the "extra curriculars". The marching band, cheerleaders, and dance team all performed at levels far exceeding my expectations. Thinking that Will - or any eight- or nine-year-old, for that matter - could in just six short years be ready to join these groups of talented teenagers baffles me. 2,000+ student high school even had a marching band. 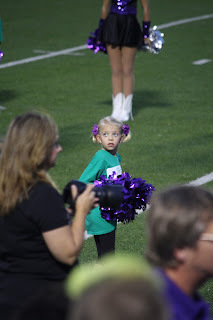 and Hallie love watching her dance. Our Friday Night Lights crew - early birds get the good seats! Fourth, the "feeling". The energy and enthusiasm within the complex were contagious, and we couldn't help but join in as the fans around us cheered for everything that took place both on and off the field. 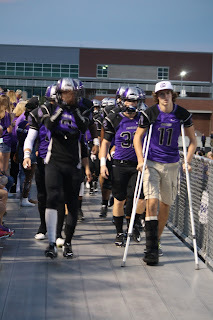 before making their grand entrance onto the field. inside this giant inflatable and waited to run out onto the field. 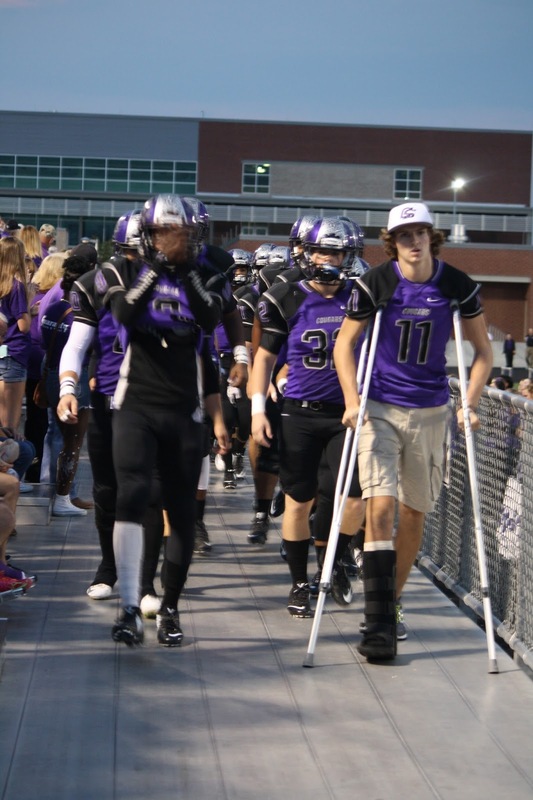 CSHS scored first and eventually won the game. Ready at the line of scrimmage. weren't alive when that movie came out. Fifth, the resolution. We saw countless people we knew - all decked out in their Cougar Best and cheering like their lives depended on it - which surprised both Tom and me because the majority of these people don't have kids in high school. If we hadn't bought into it before, by the end of the night we had fully accepted the fact that in Texas, high school football is a big deal. 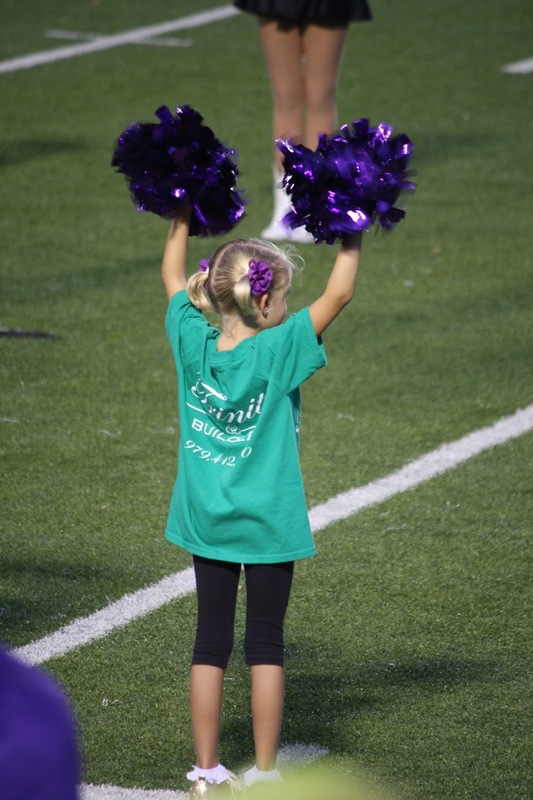 Friday Night Lights is an event, the reach of which extends far beyond high school students and their parents. 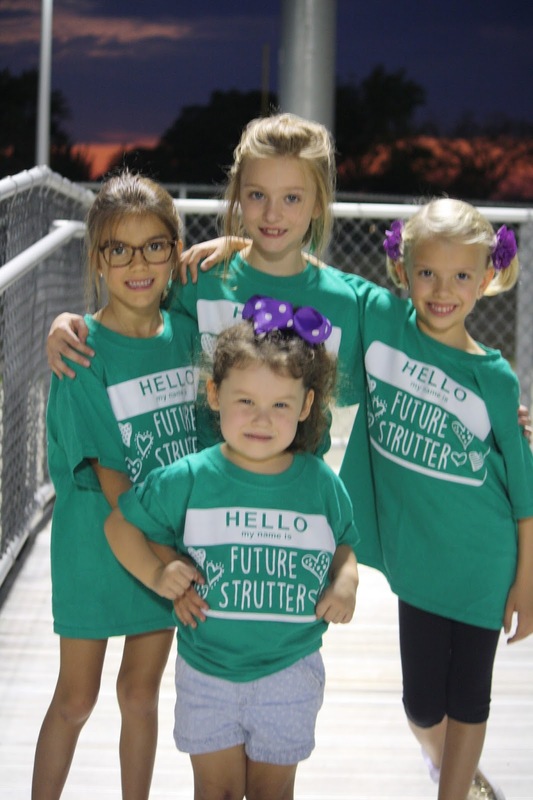 And last but not least, a few pics of the "Future Strutters" in action. Getting ready to take the field. Standing at attention during the National Anthem. 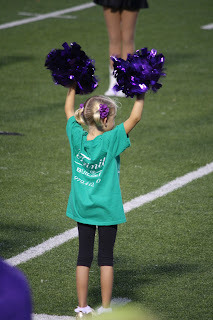 Cheering for "those really big guys". and led to this perfect double take. 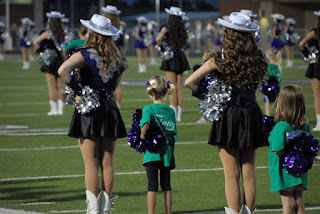 contributions to the spirit line. loves that their names rhyme. to have trouble containing the kids). No, we don't have kids in high school. But yes, we will see the Friday Night Lights again.